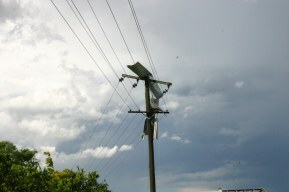 Debris on power lines at Berry Park (Morpeth). Thunderstorms with hail, heavy rain and strong winds occurred in isolated areas of the Hunter this afternoon, causing damage. The thunderstorms developed from approximately 2pm onwards. A thunderstorm that passed through the Morpeth area (near Maitland) between 3 to 3:20pm, caused minor roof damages and flash flooding. Hailstones as large as 4cm were observed. A maximum wind gust of 111 km/h from the NNW was recorded at Berry Park (4km east of Morpeth). Further more, 29mm of rain fell in less then a 10 minute period and hailstones averaging 3cm in diameter were recorded. Majority of the thunderstorms this afternoon developed wall clouds. A green tinge surrounded the wall clouds, an indication of hail.